Scottsdale real estate much like the rest of the Phoenix metro area is on the rise. When mainstream media such as AZ Central publishes the news on the front page it’s starts to build the momentum even further on the street. The numbers always sound more impressive on the way up. Remember if prices dropped 50% from their peak they to increase 100% just to get back to where they were before. Home prices need to go up 100% just to get back to where we were. Mike Orr, director of the Center for Real Estate Theory at ASU, doesn’t expect home prices to continue to climb as fast as they did in March over the next few months. But he projects metro Phoenix’s housing appreciation for 2012 to reach 25 percent by September. Orr credits the turnaround to steep drops in foreclosures and in the number of homes for sale, coupled with an increase in sales. Fewer foreclosures means fewer inexpensive homes for buyers. The number of homes taken back by lenders in metro Phoenix is down 60 percent from March 2011. Housing inventory has dropped steadily during the past year because of a record number of investors snapping up properties out of foreclosure. 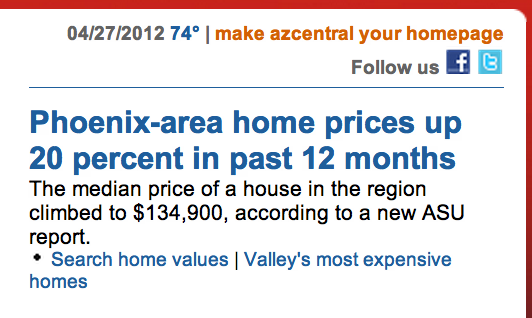 Full article in AZ Central real estate section. The article mentions that much of the rises have been driven by investors. These are not just individual investors any more. REITs and Hedge funds have been building large portfolio’s of single family homes. 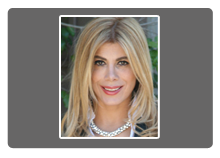 Still want to invest in Arizona real estate? There are opportunities still but there’s just so much competition at the lower price levels. So the real opportunites may be to do less deals but at a considerably higher deal size. Picking up 20 single family homes for under $70,000 is no easy task any more. So look for deals in Scottsdale in the $400,000 to $800,000 range. There’s still real estate buying opportunities in this area.